I was my own personal favorite 🙂 and always treated myself special but somehow it was hard for my friends to understand this act of self love, and they thought I was not humble. Gradually I learned that it was not good to tell people if you were good at anything upright as it was considered as being proud or boastful. I saw my parents rarely speaking about our accomplishments in front of us as they feared we would be flying on clouds of pride. Appreciation was rare and if some family/ friends complimented we would deflect the appreciation or shy away. As I grew up I lost touch with the “self love” aspect and gradually it manifested as a self negating internal conversation of “I am not as good as xyz, her hair was better than mine, her grades are better, she sings better than me”. This constant negative self talk resulted in weight gain, dull complexion and poor self image. I started meeting people who reassured I am not so good and need to really work on my self physically and emotionally. Even in my relationship I had tough time proving my worth 😦 but with time gradually I realized it was nothing to do with others but it was a reflection of my own thoughts and my own poor self image. In life we are all faced with tough situations testing times and if you instead of feeling victim of the external situations, you are able to look within and introspect you will understand how these people and situations are only a reflection . Thanks to my calling of Pranic Healing that helped me restore my faith in me 🙂 it made me believe I AM SPECIAL !! 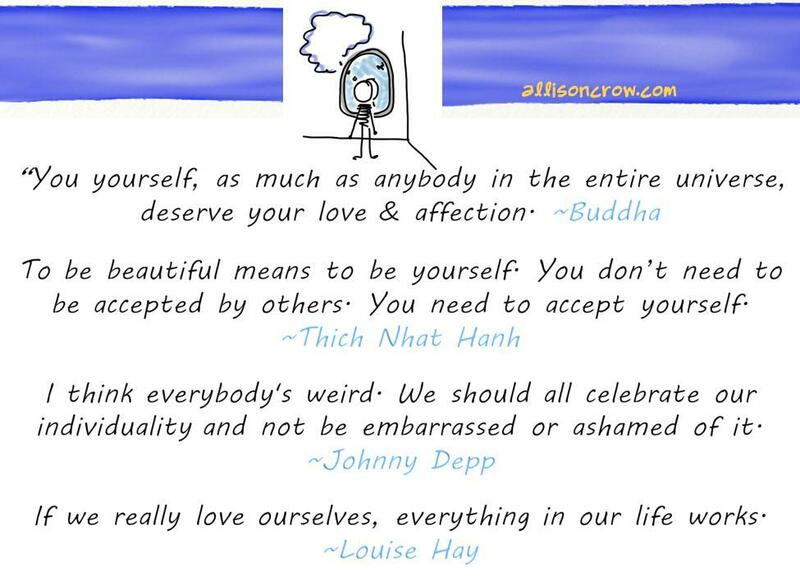 From Buddha to the Hollywood actor Johny Depp has spoken about how important it is to love your self. A person who cannot love himself or inflicts himself/herself of pain is responsible for inflicting pain to others. If you love yourself you will understand and appreciate the individuality of others ; you will be able to respect and appreciate others with an open heart. Self Love helps us connect with our own self and trust me when I write this I write out of experience , the first time I stood in front of the mirror dropping all judgement about me and looked into my eyes there was so much I wanted to say to my self. There was so much love , so much acceptance I had deprived myself of. I had feared been alone by myself and I was just craving for someone else to love me, approve me, compliment me. After a couple of minutes there was this knowing that I was not just what I could see in the mirror I was so much more and it was a big revelation. I just silently promised I will again bring back that child in me. I am Special and I did not need an assurance or approval for thinking this. I know most of us have been in situations where we do not have time for ourselves, we are too busy in caring and loving others waiting for them to love us but if we continue this for a long time we will become emotionally bankrupt. Self Love is the way to maintain your bank balance of love. Amazing…hw can u imagine & describe it i.e., out of world!!! This Mantra is meant to start ur day with love,trust and self beliefs for yourself. Hey Sargam, wonderful thoughts and I think evryone can relate to it. Everyone should learn from this and this is another to say that happiness is within us. There is no need to look for happiness in others. We have everything within us. We are so powerful. Sargam lovely thoughts..I was watching the movie Kung fu panda the other day and the message of No special ingredient was so heart touching. Now your blog just related that to self love in beautiful words. Blessing to you!! Reblogged this on Delight The Soul. Hello Sargam…Your awareness and depth of love of self is so awesome…so glad I found your blog!